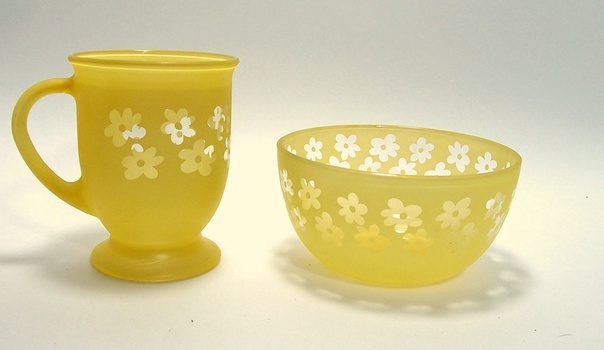 I love retro kitchen stuff and I brought home a set of 6 each mugs and bowls. There is an anchor on the bottom of the mugs. Not the usual anchor and H that I associate with Anchor Hocking. I can't find them in any of my books. Any ideas? Thanks. No ideas but these look great and your photo is excellent! Thanks racer4four. They are very cool, and a mystery! Hi TallCakes, thanks! Do you think these are newer? The mark is just an anchor, no box around it. I wish I could find another picture of them. thanks WeirdPuckett, I have never seen them before either. The mug is hefty, I imagine it would hold 12 oz! AH has the café mug listed as 16 oz. AH may have done the décor for a specific retail outlet. Thanks so much. I never thought to go straight to the horses mouth, as they say. Perhaps I can find out who they were made for. Appreciate your help! Riply206, thanks for this new info. I haven't heard of these companies before and will check them out. I will also try to get a pic of the anchor. thanks again!